Prem Chand Brothers are leading Manufacturer, Exporter, Traders, Wholesaler and Suppliers of a wide range of Jewelled Stoles or Scarves. We are mainly looking for Inquiries from European Countries like UAE, USA, UK, Russia, Germany, France , UK , Italy , Spain etc. We are looking bulk inquiries from Mumbai, Chennai, Kolkata, Bangaluru, Ahmedabad, Hyderabad, Lucknow, Kanpur, Varanasi, Jaipur, Jodhpur, Ajmer, Bikaner, Kota, Udaipur, Bhilwara, Alwar, Agra, Meerut, Aligarh, Allahabad, Banaras, Mathura, Jhansi, Ghaziabad, Noida, Bareilly, Moradabad, Saharanpur, Uttar Pradesh, Punjab, Chandigarh, Jalandhar, Amritsar, Ludhiana, Bathinda, Pathankot, Patiala, Hoshiarpur, Himachal Pradesh, HP, UP, MP, Shimla, Dharamshala, Uttrakhand, Dehradun, Haridwar, Roorkee, Rudrapur, Rishikesh, Nainital, Udham Singh Nagar, Indore, Bhopal, Jabalpur, Gwalior, Ujjain, Sagar, Ratlam, Satna, Dewas, Gujrat, Surat, Vadodara, Rajkot, Bhavnagar, Jamnagar, Gandhinagar, Karnataka, Davanagere, Belgaum, Hubli, Chitradurga, Tamilnadu, Coimbatore, Madurai, Salem, Trichy, Tiruppur, Erode, Vellore, Kerela, Kochi, Thiruvananthapuram, Kozhikode, AP, Andhra Pradesh, Visakhapatnam, Vijayawada, Warangal, Guntur, Nellore, West Bengal, Asansol, Siliguri, Durgapur, Bardhaman, Bihar, Patna, Gaya, Bhagalpur, Muzaffarpur, Jharkhand, Jamshedpur, Dhanbad, Ranchi, Assam, Guwahati, Agartala, Shillong, Haryana, Karnal, Ambala, Panipat, Rohtak, Hisar, Faridabad, Gurgaon, Maharashtra, Pune, Nagpur, Thane, Nasik, Aurangabad, Rajasthan, Goa, Jammu, Srinagar, J&K, Chhattisgarh, Raipur, Bhilai, Bilaspur, Korba, Odisha, Bhubaneswar, Cuttack, Rourkela, Navi Mumbai, Virar, Kalyan, Bhiwandi, Puducherry and all over India. Jewelled Scarf with inserted jewellery is the new trend in the market . With many designs and different colors in vibrant prints makes them a great collection in every store. 1 Pack: Each piece in a poly. 50 pieces in a master Carton. 12 pieces in a master poly. Packing Singe piece, naster poly of 12 pieces. We are one of the most prominent names of the industry engaged in manufacturing, supplying, wholesaling and exporting exclusive jewellary stoles. Material : cotton / rayon / polyster / silk and chiffon. Jewellary : trendy / Bulk pack of 25pcs. note: since these are handcrafted and made every time with the available materials, there are possibilities of little change in the jewel piece or the stole design. We are one of the most prominent names of the industry engaged in manufacturing, supplying, wholesaling and exporting exclusive necklace style stoles. Material : cotton / rayon / polyester / silk and chiffon. Trendy stoles. Designor jewelry stoles. Fashion stoles. Latest pendant stoles. Adhering to our international quality production, we have earned the client's faith towards our qualitative Pendant Scarves. Our offered designer scarf is fabricated by using superb quality fabric along with other associated material that is procured from the most consistent vendors of the industry. This designer scarf is highly commended for its shrink resistance, matchless quality and color fastness. Note : Since these are handcrafted and made every time with the available materials, there are possibilities of little change in the jewel piece or the stole design. Adhering to our international quality production, we have earned the client's faith towards our qualitative necklace in stole. Our offered designer stole is fabricated by using superb quality fabric along with other associated material that is procured from the most consistent vendors of the industry. This designer scarf is highly commended for its shrink resistance, matchless quality and color fastness. Material: cotton / rayon / polyster / silk and chiffon. Rate: 3600/- for a Carton of 20pcs. Each piece packed in a PVC BOX. Pendant Stoles offered by us can be made available in different choice of colors, weaved design patterns as well as fabric choices so as to perfectly match up with the demands of customers. 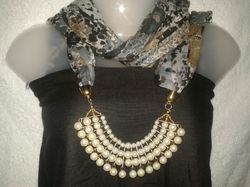 Necklace Scarves with inserted jewelry is the new trend in the market . With many designs and different colors in vibrant prints makes them a great collection in every store. Pack: 1 Carton of 20 pieces in different designs with each piece packed in a trendy PVC BOX. We are one of the most prominent names of the industry engaged in manufacturing, supplying, wholesaling and exporting exclusive anklet stoles. We keep on changing patterns as per the market trends. Rate : 3600/- per pack of 20pcs. Packaging Details: Single Piece in PVC Box and 50 Pieces in one master carton. Adhering to our international quality standards, we have earned the client's faith towards our qualitative necklace stoles. Our offered designer scarves are fabricated by using superb quality fabric along with other associated material that is procured from the most consistent vendors of the industry. This designer scarf is highly commended for its shrink resistance, matchless quality and color fastness. Rate : 3600/- per pack of 20pcs (assorted) in 1 Carton with each piece packed in a PVC BOX. Elegant printed scarf with designer necklace offered are made by us in different color shades as well as printed styles with keeping in mind the latest market trends. Further, the rich use of colors as well as soft fabric finish also makes these scarves highly liked and desired by the customers. rate: 3600/- per pack of 20pcs in 1 carton, each piece packed in a PVC BOX. rate: 3600/- per pack of 20pcs. 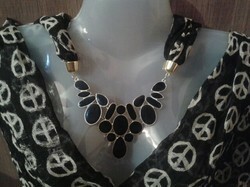 28"/72" black stole with hand crafted black neck piece. pack: 1 carton of 20pcs of all different designs with each piece packed in a PVC BOX.